As PLW and I finished our morning Bible study, we both let out a long sigh and I could tell something was weighing heavy on his mind. "You know how the Book of Revelation quotes the mighty kings of the earth lamenting the fall of Babylon in one hour?" I nodded my assent. "Well, the way our elected officials have behaved themselves in the last couple of weeks, I'd like to think that God will narrow His view of Babylon to include just Washington, D.C., and spare the rest of the country." He paused and then said, "But, I'm afraid we will all be judged by their actions." I know what he means. When we are governed by men who think it makes "common sense" to raise a debt ceiling that is already at nearly $17 trillion, it is quite apparent to those of us in the hinterland that unadulterated madness is the norm in D.C. I see nothing but greed and corruption; lies and gamesmanship. For the men and women ensconced in their ivory towers, the world revolves around their tight little circle of power and influence. Representative government no longer exists, and those few who still hold to those high principles are vilified and discredited. Would it surprise you to know that the so-called "deal" generated by the power brokers has left us tax-payers in an even more compromised position, as if that is even fathomable? According to The Daily Caller, there’s no actual debt ceiling right now. That's right! The fiscal deal passed by Congress on Wednesday evening to re-open the government and get around the $16.4 trillion limit on borrowing doesn’t actually increase the debt limit. It just temporarily suspends enforcement of it. In other words, Congress has managed to put a clever smokescreen in place. By voting to simply suspend the debt right now, they don't have to release the new numbers to the American people of just how fast the debt is climbing. They can hide their vote in a cleverly disguised ruse to fool the American people into thinking they are working on their behalf, when in reality they have just removed any limit on the debt! So now the next question is this: just what are they planning on doing in the intervening months between now and February? Rather than patting themselves on the backs for appearing to have saved the country and its economy from collapsing, they should all be revealed and criticized for what they really are... betrayers of the trust bestowed upon them by the American people. Obviously, it was blind trust, as the only ones they are truly interested in looking after is themselves. While the proposed deal will provide funding for a temporary time period, when all these ridiculous "negotiations" will have to be resumed after the first of the year, D.C. managed to put themselves above the rest of the country. On the issue of District of Columbia funding, the bill gives the District the right to spend all of its local funds for the rest of fiscal year 2014, making it immune from any possible shutdown later in the fiscal year. Not really a surprise, is it? In the meantime, Washington continues to ignore all the warning signs of impending doom. There are rumors of plans to triple legal immigration to over 33 million in the next decade; the forced compliance of the Affordable Care Act looks like total chaos; China is definitely not impressed with our "debt deal", downgrading us on par with Brazil, Israel and Panama; not to mention our nearly non-existent border security and growing concerns over "dry run" terrorist activities. I wish I could have disagreed with PLW over his identification of Babylon. But all the signs are there and the events are beginning to correlate. Is Washington, D.C. totally lost? 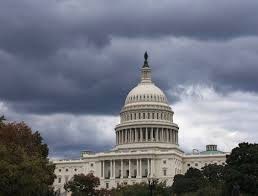 All the power and might of the Evil that is D.C. is being brought to bear upon the few righteous men within the system. Can they prevail long enough to bring about any real change? Only if God decides to delay His judgment that is duly appointed. Pray for them, and pray for this country. It is our only hope. UPDATE: And I applaud Dianne Reidy, the veteran Congressional stenographer, who listened to the Holy Spirit's promptings and took to the microphone on the floor of the House of Representatives to chastise the politicians for their waywardness. She shouted, "He will not be mocked" and "You can't serve two Masters" as she was led from the Chamber and subjected to the inevitable psychiatric evaluation. After being awakened in the middle of the night for the last 2 1/2 weeks, Mrs. Reidy stated that the Holy Spirit was "preparing me (through my reluctance and doubt) to deliver a message in the House Chamber. That is what I did." How many of us can identify with such encouragement from Heaven? I'm sure she will be represented as some crazy Christian and marginalized. But maybe ... just maybe ... God is preparing His people for great works on His behalf. Thanks Belle for adding the stenographer, Dianne's, message to the pariahs in Washington. I wish more people would stand up for what they believe in, instead of cowering under the infrastructure called government. I am spiritual, not religious, I believe in a higher power. He or she will give us the strength to get through this time of peril. Thanks for your words of wisdom and conviction, I wish I knew more people that had morals and values.